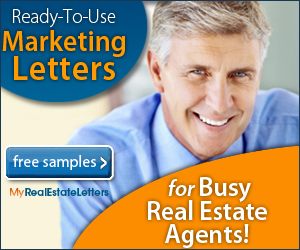 Are Real Estate Prospecting Letters Obsolete? Although the way people communicate and gather information has changed dramatically over the past couple decades, real estate prospecting letters are not at all obsolete — especially when you consider how they can be used in email marketing, website content development, and real estate blogs. Sending real estate marketing letters to prospects the “old fashioned way” (using the postal service) is still a viable way to generate leads, produce inquiries, get referrals, and maintain “top of mind” awareness in your farming area. Real estate agent marketing letters, when used correctly, can be a valuable part of an overall integrated marketing plan. By creating a marketing plan that consists of a combination of cost-effective strategies, then one method will tend to reinforce other marketing avenues and work together in a synergistic way. Impeccable knowledge about real estate marketing (both “old school” and “new school”), superior communication skills (aka “people skills”), an excellent understanding of how real estate transactions work (from start to finish), and a high level of motivation to produce results for your clients and generate income for you and your family. Establishing goals and creating a real estate marketing plan that encompasses several different techniques, including Web-based marketing, the use of real estate prospecting letters, selective advertising (based on your budget and the value of the advertising medium, itself. ), and, of course, plenty of face-to-face networking and phone calling. Those aren’t all the components of a real estate marketing plan, but it represents a snapshot of many of the key elements. Thanks for checking out my latest thoughts about real estate marketing, prospecting letters, and marketing tools. Stay tuned for more real estate agent marketing ideas over the next few days. *Disclaimer: Many of my blog posts about marketing for real estate agents contain links to websites, services, and digital products for which I am a compensated affiliate.